Stuff with Style is a brand new range of quality t-shirts and hoodies aimed at cyclists. Developed by keen cyclist Neil Rhodes, the clothing range offers an extensive selection for both Men and Women. I’ve always thought that cycling t-shirts work best when they deliver funny slogans that are particularly funny to fellow cyclists, sharp designs, quality fabric and reasonable prices. The Stuff with Style range certainly does that so chapeau to Neil and his team. The range take inspiration from some of the more classic cycling slogans like ‘Just Ride‘ and ‘MAMIL‘ (if I had to explain it you’re in the wrong place) but also offer a modern twist with Jedi-esq slogans such as ‘Go Cycling You Must‘ and ‘WWJD: What Would a Jedi Do‘. 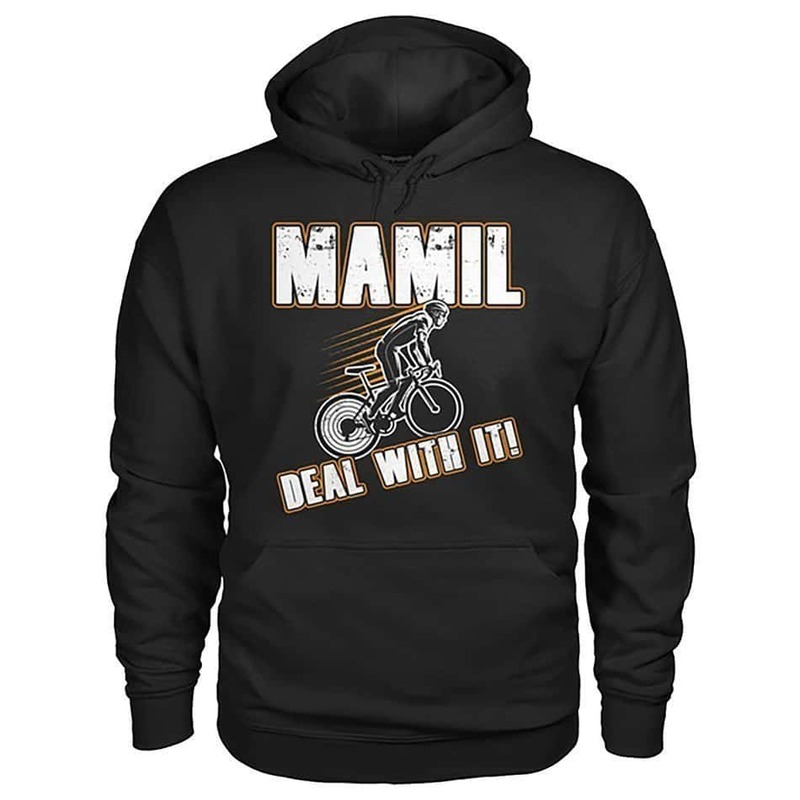 Additional slogans include the obligatory KOM and QOM t-shirts, plus a pretty nice hoodie with ‘Eat Sleep Ride Repeat‘. However, my personal favourite is one that pretty much reflects where I’m at in my cycling career and comes in a choice of two t-shirts. In large lettering, it says ‘Senior Cyclist‘ but nestled within the design in smaller letters is, ‘Because – unfit old geezer on a bike is too much of a mouthful‘. Overall, there are ten slogans to choose from in a wide range of colours and are available in both Mens and Womens t-shirts plus a selection of hoodies. I was going to list the full range of colours available but it became far too long, which is a short statement to the effect of there being a broad choice to suit Men and Women equally. Yes there are the standard blue, black, red and pink but there are also some pretty weird descriptions too, like heliconia (pink), garnet, antique cherry and azalea (pink). Somewhere between these extremes are familiar colours of light blue, orange, maroon, sapphire, navy, royal and Irish green. The t-shirts are available in pre-shrunk cotton, hopefully meaning that both middle-aged mamils and young bucks alike won’t ruin them in the wash. These are quality t-shirts, both in terms of how they feel and also how they wash and wear. I’ve had one for a few weeks now and it’s fast becoming one of my favourites. As you’d perhaps expect, the t-shirts are made from 100% cotton and are made with taped neck and shoulders, plus double needle sleeve & bottom hems. Prices are where you’d expect them to be for t-shirts and hoodies of this quality. Womens t-shirts are £13.99, Mens t-shirts are £15.95 and the Unisex hoodies are £29.95. The above Buy Now button leads to a safe and secure product page on the ViralStyle.com website. This is a US based website service used by the Stuff with Style to sell these great t-shirts and hoodies. If you are ordering from within the UK, then there may be a slight delay in the products arriving, as they have to fly across the pond. Other than an extra day or two in addition to what is typical in the UK, there shouldn’t be any other delays or issues. Just one note, there are no additional taxes or import duty to pay. Postage is clearly shown when you place the order and it’s around £6. One thing that is slightly different to buying from other websites is that the Viral Style listing has to end before the items will ship. You’ll see the count-down on the page when you visit the site. Viral Style have a 7-day window to sell the items so with the added delivery time, it could take upto two weeks to arrive .. but it’s worth it! View the full range of Stuff with Style Cycling T-shirts & Hoodies. The above Buy Now button is not an affiliate link and I am making no money from this review. It is a genuine personal review of the Stuff with Style range. I clearly haven’t worn all of the t-shirts or hoodies but I am wearing one as I write this! Summary Stuff with Style is a brand new range of quality t-shirts and hoodies aimed at cyclists. The range consists of 10 different cycling slogans and too many colours to count. PreviousWho has the Cheapest Bikes?